Serenity Now Travel Blog: Finding Nemo...part deux. Well, enough about the snow. No one's here to read a travel blog highlighting the joys of snow shoveling after all. In case you've forgotten...we're going to Hawaii!!! In just 80 short days. Ugh. It feels so close and yet so far. 80 days is a lot, then again that's only 11 more Saturdays. Meh. That's still a long time. Thankfully I have this blog to share my excitement. If you're new to my blog you don't know that I married my polar opposite. While I enjoy planning my next vacation and have the countdown down to how many more Saturdays until we leave, MattyBoy on the other hand, doesn't like to think or talk about the vacation until it's a week away because, "...it makes it take longer to come". Awesome. Now you can see why I'm so thankful for this blog. I gotta talk to someone about my OCD planning extravaganza. So buckle up blog world. Here we go. Last post I gave a pretty brief rundown of our 15 day Hawaiian Adventure. This post I'll get a little more in depth in my details, starting where else? From the beginning of our trip. On Friday, May 3rd (80 days, 17 hours, 26 minutes & 25 seconds away, but who's counting?) we'll be leaving for Hawaii. Originally, we were leaving on Saturday, but we would save over $350 by leaving on Friday instead. Since we're staying in our Disney Vacation Club timeshare resort, the extra night is not costing us anything extra, so it was a no brainer. Hmm. Have an extra day in Hawaii & save some money. Oh, I don't know. Maybe I should pray about it. *insert heavy sarcasm here*. Our flight is with Hawaiian Airlines out of JFK & the best part...wait for it. It's a nonstop! Even better, I paid less for these tickets than we did for my parents & I's non-stop tickets to Hawaii in 2008. $600 each roundtrip, it's a non-stop and Hawaiian Airlines is one of the few that still includes free meals. Score. Our flight is leaving at 10am(est). They just changed our flight times, so I'm glad I checked. It's an 11 hour flight that will get us to Hawaii at 3pm(hst), that's 9pm(est). By the time we get to Hawaii that'll be a 17 hour day, and we have to force ourselves to stay up to at least 9pm(hst), 3am(est), so that we will have as little jetlag as possible. All that said, our travel day will be a 23 hour day...that's 23 hours straight we're awake. If that doesn't sound like a relaxing start to a vacation, I don't know what does. Since our flight is 11 hours, we should get a little sleep while inflight, so that's an exagerated calculation, it should be less. We'll see what the exact timing ends up. Our flight includes meals so on this flight we will be served lunch, dinner & snacks. They also have in-seat entertainment systems. Personal tv's with 20+ movies to rent, games(that can be played against others onboard) & music channels. Each seat also has a usb port for charging phones, cameras, etc. Also, we are in a row of two seats, so no sitting next to strangers for us. All that said, I'm not too concerned with the 11 hour flight. I have seven 10+ hour flights under my belt. I always feel they go quick, especially getting there since you're so excited to be starting your vacation. Matt on the other hand is a little anxious. Matt is just a tad bit hyper, so we'll see how this goes for him. Once we arrive to Honolulu, we'll be renting a car for the week. I'm a little apprehensive about the infamous Honolulu traffic coupled with Matt's Jersey Boy Road Rage, but with a week on Ohau, a rental car's the only way to go. I rented the car thru Discount Hawaii Car Rental and got an amazing rate. I will continue to email them to see if I can get it lower. The travel time to the hotel, Disney's Aulani Resort & Spa, should be 30 minutes, but that's not accounting for traffic. Our first accommodations on this mega trip is the one I am most looking forward to. Disney's Aulani Resort & Spa. This place looks like heaven on earth. It's got it all and as a big Disney fan I am so excited. Not to mention that this heavenly resort is included in our Disney Vacation Club membership. I booked us an ocean-view studio. I was going to splurge & get a 1-bedroom, but I just can't see it being worth it, since it's just the two of us, we're only there 4 nights & how much time do you really think we'll be spending in our room? Seriously. Originally I was planning to have us stay here the entire first week, but as heavenly as this resort is, I love the Waikiki area, especially at night. Aulani's kinda in the middle of nowhere, we need a little more excitement after a while. Driving to Waikiki each night would be a hassle, to say the least, so that's why we're only at Aulani for 4 nights. 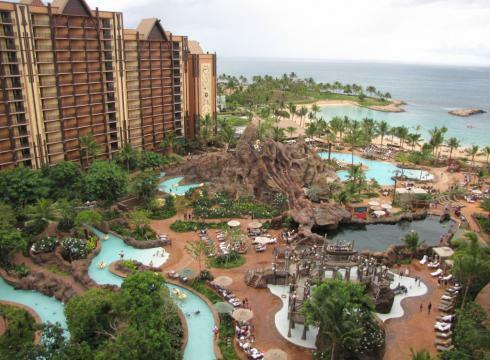 Aulani is situated on a beautiful lagoon, it has multiple pools, lazy river, slides and even it's own snorkeling lagoon where we can again, find Nemo, vacation style, no snow shovels needed. So exciting. It also offers free laundry & parking since I am an owner. Parking at Aulani is $35 per night for non-owners. Ouch. As gorgeous as the lagoon is, it does not have waves and Matt is a huge fan of waves. Another reason for the rental car. Gotta get my man some waves. Aulani is gonna be fun, don't get me wrong, but it's a much more relaxed place which will be good for the beginning of our trip, but we'll start to get a little bored, so 5 days will be perfect. Another great feature they have at Aulani will be familiar to those who've sailed on the Disney Fantasy or at least read my trip report from our trip in Oct. Aulani has it's own interactive scavenger hunt throughout the resort just like the Fantasy's Midship Detective Agency. Aulani's does not include the Muppets like the Fantasy does but we're in Hawaii, I'm not complaining. I'm thinking once we arrive at Aulani, probably around 4:15 we'll get something to eat, check out our room & then go do the scavenger hunt, Menehune Trail, to keep us awake & moving. We'll see how that goes. Well, I think that's quite enough of my rambling for one post. Next up, Day 1 plans...tentative, of course. Sounds like a great start...can't wait to read more.